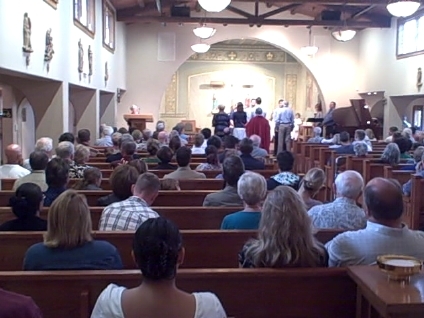 The introductory rites help the assembly become a worshiping community. They also prepare us to hear God's word and celebrate the Eucharist. There are several elements to the introductory rites of Mass. The cantor or another minister may introduce the liturgy. We sing the entrance song and make the sign of the cross. The presider greets us. The penitential rite or rite of blessing and sprinkling holy water follow. We sing the Glory to God. Finally, the presider offers the opening prayer. A lot happens in just a few minutes. The cantor's introduction may tell us about the music, the special nature of the celebration or the ministers of the day. Some communities invite members to greet one another. The entrance song sets the tone of the celebration. We may sing a seasonal hymn or one that refers to the Scriptures of the day. We sign ourselves with the cross, and the presider greets us with a phrase like, "The Lord be with you." Christians can trace that gesture and those words to the earliest days of the church. The penitential rite or the sprinkling rite symbolizes our desire to enter this celebration in purity of heart. On most Sundays we sing or recite the Glory to God in praise of the Trinity. This hymn comes immideiately after the penitential rite, causing us to shift moods rather quickly. The introductory rites all lead to the opening prayer. When the presider says, "Let us pray," we pause in silence. This prayer explains why we come for this Mass and gives God praise. It brings the introductory rites to a fitting close.